Beholder is a video game about life in a totalitarian State. 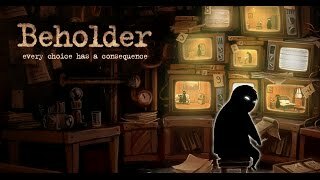 Developed by Warm Lamp Games and published by Alawar Entertainment, Beholder was released on Steam on November 9, 2016 and supports Windows, mac and Linux. The opening sequence is beautiful with dramatic music and very mysterious moments, which set the tone of the game very well. The voice is dramatic and the artwork style is very unique. The game begins on September 1st, 1984. The name of the main character is Carl, a government installed landlord in a totalitarian state, appointed to spy on the tenants of the apartment and eavesdrop on their conversations. You can tell that it isn’t going to be pleasant in the building because it starts with someone being dragged out after being tortured and handcuffed. You can search the tenants’ apartments while they are away and find clues about them to see if they are a threat to the state. The aim of the game to try and stop anyone that is capable of going against the law or plotting treacherous plans against the government. However you’re given the chance to follow the orders of the government or go against them. I like games that are affected by what you choose. You can choose Carl’s issues, personality and circumstances. Every decision affects the story because there are several endings to the story which are chosen by the choices you make. This gives players an element of control and makes the game more personal. You can earn money and reputation points for doing missions. Reputation points show your standing with the public and you can use them to persuade people around you to do what you want them to do. One thing that wasn’t great about the game was how you move. You have to click where you want to go and that made it a little difficult to move around. However, I put that down to my personal bugbears about the point-and-click genre and this did not detract from the plot. You have a key that grants you entry to every door in the building. I really liked how you looked in the rooms to do research and find out more about the person – this really showed the level of detail of the game. If you get caught or do not succeed a task you get fired and you have to start that task again. You have to be careful no one finds you in their room, which causes great tension. This is a great game with a compelling story, beautiful artwork and a good soundtrack. I really like the style, atmosphere and art of the game. The story is interesting and the ability to choose which path you take, and ultimately decide the ending, is what separates this from other games. Beholder is available to buy on Steam for £6.99 now.